While we’ve become used to seeing the Doctor flirt and become infatuated with his female companions since he returned to our screens in 2015, it’s easy to forget that the nature of this relationship was vastly different during what is commonly (and rightly) known as the classic era. Between his First and Seventh regenerations, it was always assumed that the bond between them was always based solely on friendship, but as most of us know from our experience, relationships are always far more complicated than they first appear to be. 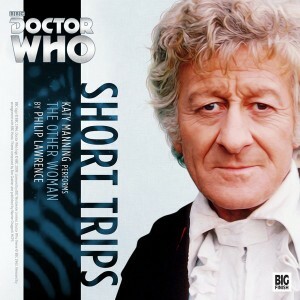 ‘The Other Woman’ places the Third Doctor and Jo’s association under the microscope, examining it from Jo’s perspective, when the appearance of a strange, exotic alien woman threatens to tear it asunder. Having tried, somewhat unsuccessfully, to join the dating scene; Jo is brought back down to earth when she’s called in, along with The Doctor, to take charge of a crashed spaceship. The occupant of the craft turns out to be Callandra, who offers the Doctor the chance to finally leave the confines of his planetary exile -an offer that the Doctor can’t refuse. But Jo doesn’t trust her, and while the entire male contingent of UNIT is falling over themselves to please their new visitor, Jo begins to realise that the end of her time with her friend might actually be coming to an end. Then just as all hope seems lost, a strange signal from the stars seems to confirm her suspicions about Callandra, but has it arrived too late for Jo to warn the Doctor? In a final showdown, Jo risks her life in a desperate attempt to save her friend, because some things are worth sacrificing everything for.